Seriously, this is the name of the dish. You’ll find it at The Grille, a popular family style restaurant known for the large portions and fair prices serving breakfast, lunch and dinner. 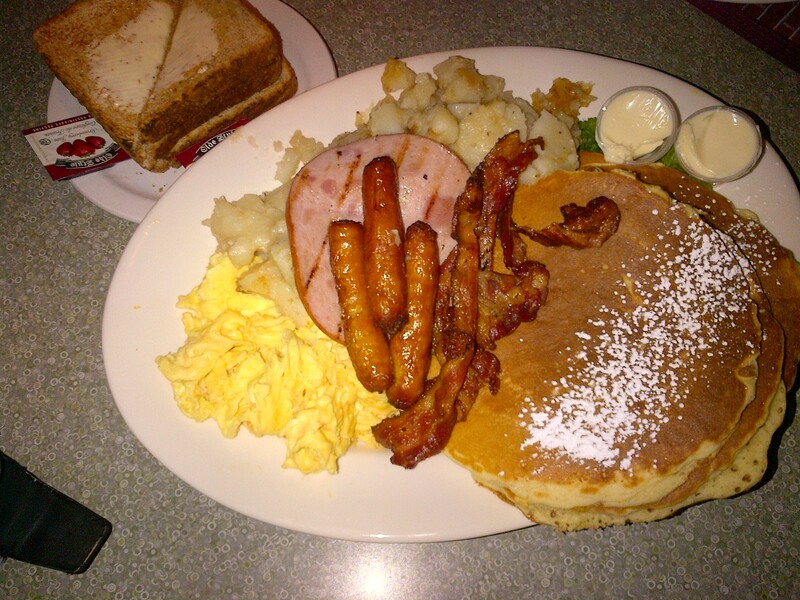 The dish consists of 4 large eggs (prepared your way), bacon, ham AND sausage, double serving of home fries, toast and your choice of pancakes or french toast. Can you say, heart attack waiting to happen? It’s definitely not the healthiest choice but I couldn’t resist trying it at least once and I enjoyed it! But it definitely won’t be a regular dish to eat if I want to live a long life. The Grille is open 24 hours and serves their breakfasts all day so it would be a great place to have late night munchies.